FREQUENTLY ASKED TRAINING QUESTION What rewards should I use with my horse? I often get asked by new trainers “what rewards do you use with your horses?” while the question they should really ask is “what rewards should I use with MY horse?” Horses are individuals with personal preferences and unique experiences, and therefore what I may be using with one of my horse in a specific training session may not fit your horse or/and your training session. 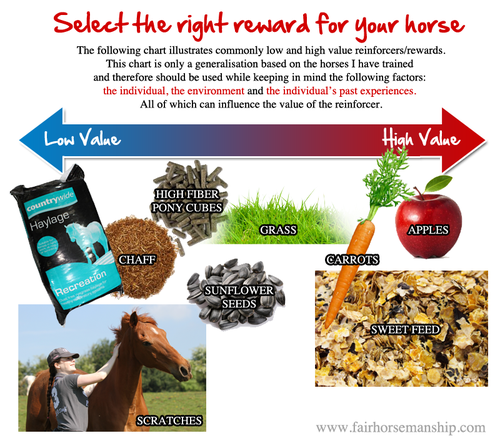 So let’s find out the right rewards for YOUR horse! Reinforcers are not all equal in value but the value of the reward depends of the individual. For example, upon completing a task you are given the choice between two different rewards: a £20 note or a doll. Whatever you chose is of higher value (to you) than the reward you left behind. For an average adult the high value reinforcer is the £20, but for a child, or even an adult doll collector the doll is most likely to be of higher value reward. For horses it is kind of the same, some will prefer the doll, some the £20. The environment may affect the value of a reinforcer. For example, you start training a riding club horse that is stabled 23/7 and get very good results using exclusively scratches to motivate behaviours. After a few weeks of training, you buy this horse and start to keep him in the field with your other horses. You find out that scratches do not work very well as reward anymore, they have moved from being high value reinforcers to lower value reinforcers. What happened? The environment has changed. The horse is now kept in an environment that allow him to fulfil his scratching needs (trees, mutual grooming with other horses) and therefore scratches are not as salient anymore. Past experiences may affect the value of a reinforcer. Many horses suffer or have suffered from forage restriction and as a consequence their seeking system is highly activated. For some of these horses food has become “too important”, causing over-arousal, biting, mugging and other undesirable behaviour. More importantly these horses are simply not happy while training regardless of food being involved. Start by making a list of everything your horse likes that could be used as rewards in training. Then rank all of theses from high to low value: what does your horse likes the most? Reinforcing more difficult tasks with higher value rewards. For example, a recall at “home” may earn a scratch or lead to a real-life reward. While a recall when out in the forestry may earn a piece of carrot or an apple slice. Reinforcing the best efforts with better rewards. I like to carry two types of treats in my treat bag: a few pieces of carrots and my high fiber pony cubes. So if the horse does something very well, with enthusiasm he will get the high value reward.